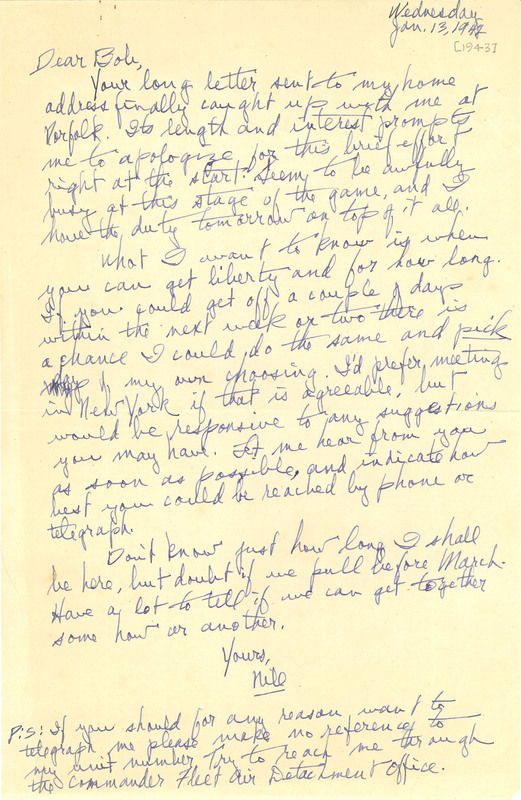 Wednesday Jan. 13, 1942  Dear Bob, Your long letter sent to my home address finally caught up with me at Norfolk. Its length and interest prompts me to apologize for this brief effort right at the start. Seem to be awfully busy at this stage of the game, and I have the duty tomorrow on top of it all. What I want to know is when you can get liberty and for how long. If you could get off a couple of days within the next week or two there is a chance I could do the same and pick days of my own choosing. I'd prefer meeting in New York if that is agreeable, but would be responsive to any suggestions you may have. Let me hear from you as soon as possible, and indicate how best you could be reached by phone or telegraph. Don't know just how long I shall be here, but doubt if we pull before March. Have a lot to tell if we can get together some how or another. Yours Nile P:S: If you should for any reason want to telegraph me please make no reference to my unit number. Try to reach me through the commander Fleet Air Detachment Office.